Frenchtowne Exteriors is a full-service remodeling company, serving the St. Louis area since 1986. We offer a complete line of quality products and services that help to transform your home into that perfect place for you and your family. We are licensed and insured, employing the best local craftsmen to provide a high-quality installation of the name brand products that we sell. We are so confident in our work that we offer a standard five year workmanship warranty on each and every installation that we perform. When applicable, we provide lien waivers and factory warranties. Recently, we have become a certified EPA (.rrp) lead renevator firm. Feel free to take a look around at some of the work that we have done and the testimonials of our satisfied customers. 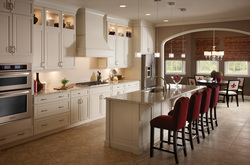 Think of us for your next home remodeling needs and let us make you another satisfied customer.